If you have a Facebook profile, chances are good that you've populated it with some information about yourself. Like say, some of your favorite games—that way, anyone can look on your page and learn a little bit about you. It's a useful feature, but it's also used so that Facebook can spit more "relevant" ads at you. These ads can be a little unfortunate, as the Tumblr Gross Facebook Ads finds out. "I started seeing a lot of gross ads on Facebook because I'm a gamer," the Tumblr description explains. "So I decided to start documenting them," it continues. 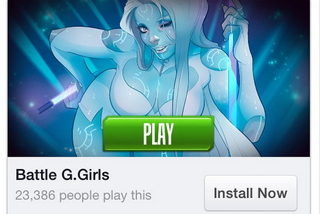 Here are a few of the ads you might see on Facebook because you like games—most of them roll with the idea that all gamerzzzzzz are boneheads who are only interested in scantily clad women. The games don't even look particularly good. It's standard fare, as far as ads on the internet go (I've gotten some of these myself/have seen ads like this elsewhere), but you'd think that, with how big Facebook is/how much information they store on the average person, that they'd promote good quality stuff OR stuff that's particularly relevant to the user. Alas! Some folks must click on these ads though, right? I gotta wonder what goes through their head when they do. "Ah yes, I'm a big boy. But also, I am not a boy, because I'm over 21. I will click this." "Thank god I'm a legal adult now. It means I can play all these awful-looking games Facebook keeps telling me about." "What lies BEYOND REALITY, I wonder?" (Okay, even I might click that top ad just to see what in the world that game is promising). "YES AM MAN. I PLAY." Feel free to share any bad game-related Facebook ads you've come across, too!